City Hall Park, one of the most sacred sites of the American Revolution, is a fitting place for statue of Nathan Hale, America's most famous martyr. The park, was the scene of the first bloodshed of the movement for American liberty, it was where Washington first had the Declaration of Independence read to his troops and it was also the site of one of the most notorious British prisons that claimed the lives of thousands of American soldiers. On Aug. 11, 1766, the first blood of the fight for American liberty was spilled on the New York Common, in what is now City Hall Park. The Sons of Liberty had set up a Liberty Pole on the Common, which was constantly attacked by British soldiers. These were more the acts of unruly and bored young men rather than deliberate actions of British Imperial policy. But the Americans were very unhappy that their Liberty Pole had been cut down and an estimated 2,000 to3,000 patriots rallied at the Commons. They threw pieces of brick at the British troops who arrived to disperse them. The British responded with a bayonette attack, wounding several Americans. While the Declaration of Independence was enacted in Philadelphia, the soldiers who would have to defend the brave statement were in New York. Washington received word on July 9 that the document had been signed. He gathered his men on the Common and had the document read to them. Afterward, Washington exhorted his men to be worthy of the newly independent nation whose uniform they now wore. The troops and townspeople then went to Bowling Green at the other end of Broadway to pull down the statue of George III. Some of the most notorious British prisons were in what is now City Hall Park. The jail, poorhouse and another building known as the new Bridewell were used by the British to house American prisoners of war. The Bridewell, named for a London jail, was the most deadly. It had no windows, only bars. The winter winds took the lives of hundreds of ill-fed patriots. There were other prisons in New York. 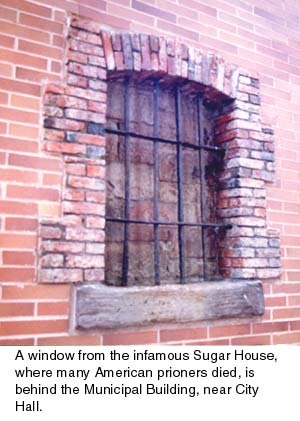 Churches were used along with a sugar warehouse south of what is now Liberty Street. Many thousands died in prison ships in the Harbor. William Cunningham was the provost marshal of the British jails. He is reported to have made a deathbed confession to starving 2,000 prisoners in the city as he sold their alloted rations for personal profit. He confessed to exceuting outright 275 American prisoners and "other obnoxious persons." Women who visited the jails to speak to their husbands through the windows were beaten with canes and ramrods. The 300 to 400 American prisoners in the French Church, now the site of Chase Plaza, were too crowded to all lie down at the same time. 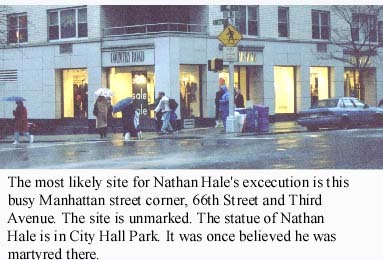 Nathan Hale, the most famous martyr to the cause of American liberty, was hung in Manhattan after making his famous statement, "I only regret that I have but one life to lose for my country." Though there is some doubt about the exact location of the famous execution, many historians place the spot at the northwest corner of 66th St. & Third Avenue, which was then the site of the Dove Tavern. Another frequently mentioned site is the Rutger's Orchard, near the present intersection of East Broadway and Market Streets, near the base of the Manhattan Bridge. Even historians who once championed this "Turtle Bay" site, now favor the Dove Tavern location based on a review of military records in the British Museum. Hale, a Yale graduate and school teacher, had enlisted in the American army as a lieutenant and been promoted to captain of an elite unit. He volunteered to enter New York after the British occupation as a spy to gather information for George Washington. He was captured with valuable intelligence stored in his boots. Hale was waiting on the north shore of Long Island just east of Huntington for a boat to take him back to American-held territory north of the sound when he was taken by British soldiers. As an American officer behind enemy lines in civilian clothes carrying spy reports, he was hung without trial. His bravery as he approached his execution awed the British and has ever since served as an inspiration to American patriots. Address: Broadway and Chambers Street. 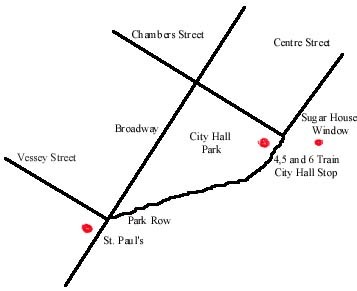 Transportation: Take the 4,5, or 6 Train to City Hall. (From McGowns Pass in Central Park, walk east from the park to get the 6 Train at Lexington Avenue and 103rd St.).